Have you ever wished you could add blog posts from Feedly to Buffer with a single click? Do you wish you had a quick, user-friendly way to save all your tweets in a spreadsheet? Or would you love to be able to add Instagram photos to a specific folder on your Facebook Page just by adding a hashtag? 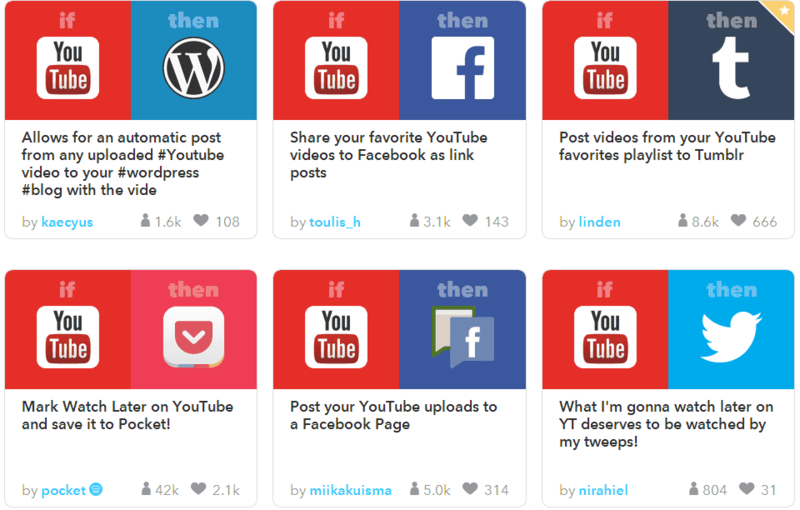 An online tool called IFTTT can achieve all of these, and much, much more. IFTTT is a powerful tool that allows users to connect up to 166 different channels together, in an ingenious way. Actions and tasks can be automated and everything from logging the changes of seasons on Mars to turning on your air conditioning when the temperature rises is catered for. 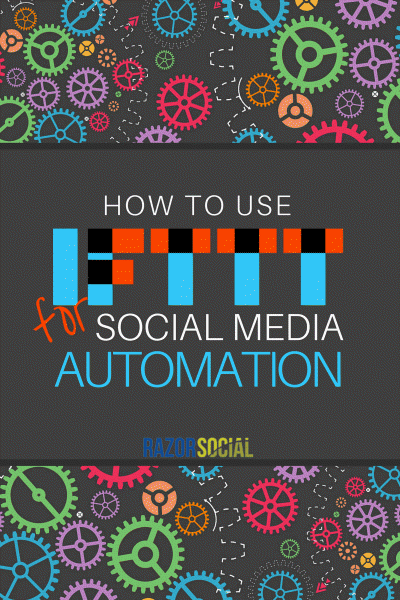 However, the wide range of social media management tasks that IFTTT can automate is more interesting to us! IFTTT stands for ‘if this then that’. It is a service that connects two services together seamlessly, using recipes (or formulas) that include a trigger and an action. So, when a specified trigger takes place in one channel, an action takes place in the other. The power of IFTTT comes from this ability to connect two completely unrelated channels and make things happen. When you have created an IFTTT account, the first thing you need to do is connect your channels. Go to https://ifttt.com/channels and choose the channels you want to connect your account to. Click ‘activate’ and go through the authorization process for each channel. There are two main ways to set up social media management systems on IFTTT: you can choose from an existing recipe, or you can create your own. Starting with recipes that somebody has already created and shared with the community is simpler, so we will start there. Click on a channel and scroll down to see the most popular recipes for that channel. For example, these are some popular recipes for the YouTube channel. And these are the most popular recipes for Twitter. As an example, we will choose to add all our tweets to a Google spreadsheet. You click ‘Add recipe’, and that’s that. It’s done. Some recipes need a bit more customization. You might want to set up a recipe so that, whenever you publish a new blog post, it is automatically posted on Twitter. You can do that with this recipe. There are two boxes to fill in before you can set the recipe up. In the first box, fill in the address of the blog feed. The second box shows the text that will be used in the tweet, which is “New post:” and then the title and URL of the new blog post. You can change this by clicking in the box. Click the icon in the top, right-hand corner to get a drop-down list of ‘ingredients’. Here you can customize exactly what will appear in your tweet. Finally, save and activate your recipe. So, now you know how to set up recipes, it’s time to show you some of our favorite ones! And not just ours… we asked some of our friends for their best recommendations, too. Since its acquisition by Facebook, Instagram uploads have displayed in Twitter feeds as a clickable link, rather than a native image. Using this IFTTT recipe, you can ensure that your Instagram images are visible when they are shared on Twitter, alongside a link to your Instagram account. Bhupesh Shah and Greg Fry are also fans of this one! Greg Fry also makes use of two recipes that help him to manage his connections: Invite (Gmail) sender to connect on LinkedIn, and Backup my (iOS) contacts to a Google spreadsheet. This recipe was recommended by Martin Jones from Cox Communications. It is a really efficient way of adding anybody who mentions a particular hashtag on Twitter to a Twitter list. Scheduling advance posts on Facebook Pages can be time consuming. This recipe lets you do it by using a hashtag in a Google Calendar entry. That hashtag signals that the content should be scheduled to be posted on your Facebook Page. Recommended by Mike Gingerich from Tabsite, this handy recipe adds every tweet you send to a Google Drive spreadsheet. You can also add Twitter mentions, new Twitter followers and favorited tweets to Google spreadsheets, too. If you would rather archive your favorited tweets in a different way, Erik Fisher of Social Media Examiner loves this recipe. 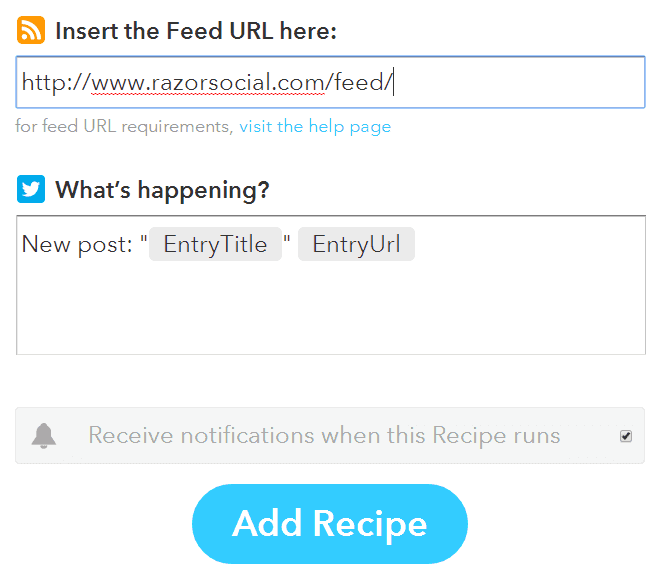 With this recipe, any time you press the ‘star’ key on a post in Feedly, it will automatically be added to the end of your Buffer queue. This recipe lets you choose a hashtag and then, every time you use that hashtag on Instagram, your image will be sent to an album on your Facebook Page. This recipe automatically uploads your Instagram pics to your Flickr account. You can see more recipe recommendations from my friends and contacts here. If you have looked at the popular recipes for each channel and searched the site but still can’t find the recipe you need, there is always the option to create your own. To do this, go to Create a Recipe. The first thing you need to choose is the trigger channel. 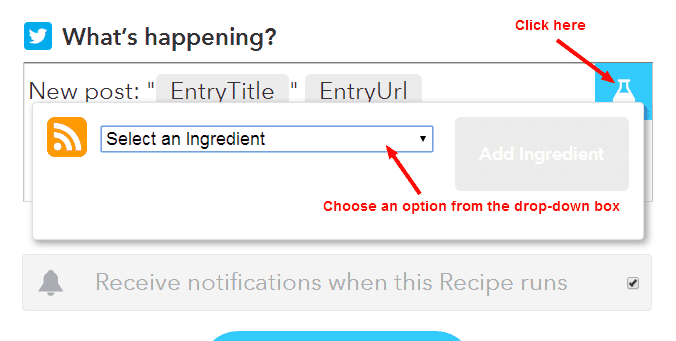 I have chosen Twitter, so now I have to choose which action on Twitter will trigger the recipe. I will choose ‘New tweet by you with hashtag’ so that the recipe will be triggered whenever I use a particular hashtag. 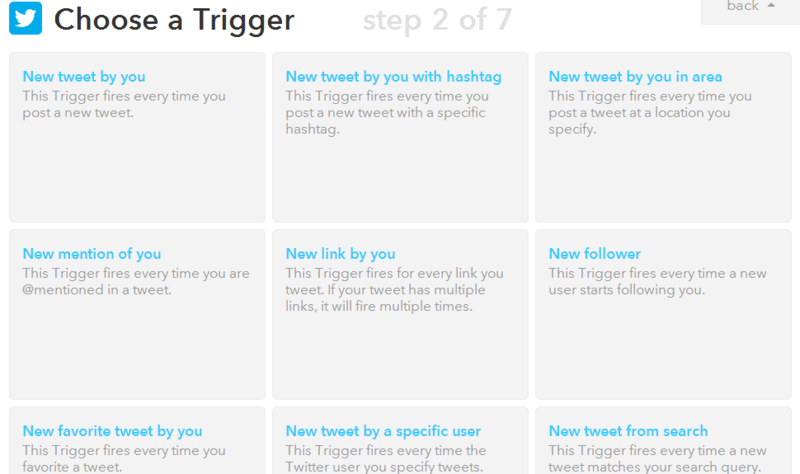 I pick #IFTTT as the hashtag and click ‘Create trigger’. Next, I need to choose the channel where the action will be taken. The ‘that’ channel! I choose my Facebook Page channel. There are three possible actions to choose from here. I choose ‘Create a link post’ and decide how the posts should be formatted. 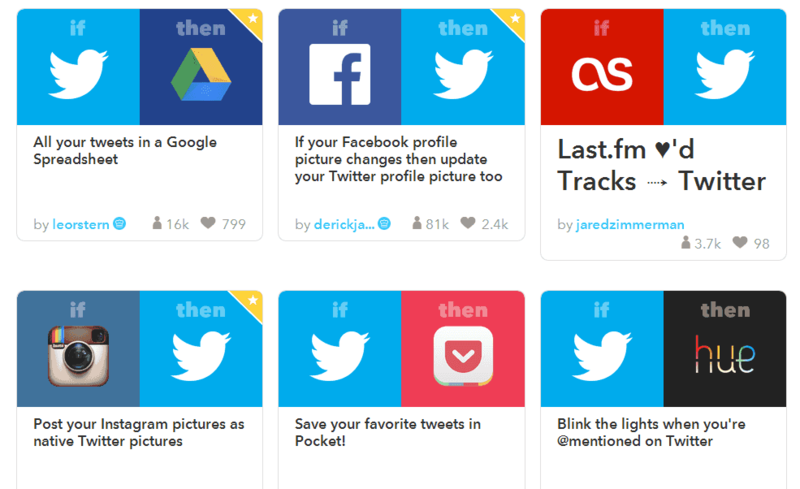 Have you used IFTTT before? If so, which are your favorite recipes? If not, are you tempted to try it now? Tell us in the comments! We love to hear from you!